Join us for our quarter-end strategy update webcast. Engage with fund manager Alexander Gunz to learn about what drove second-quarter performance, the team's outlook, and current portfolio positioning. Join us for our quarter-end strategy update webcast. Engage with fund manager Alexander Gunz to learn about what drove first-quarter performance, the team's outlook, and current portfolio positioning. Join us for our quarter-end strategy update webcast. Engage with portfolio manager, Christian Diebitsch, to learn about what drove first-quarter performance, the portfolio manager's outlook, and current portfolio positioning. Please be advised this webcast has been rescheduled from 24th January at 2pm GMT to 28th January at 2pm GMT, as unfortunately the Portfolio Manager, David Iben is unwell. An email has been sent to all client advising of this change. We apologise for any inconvenience caused. Thank you for your understanding. Join us for our quarter-end strategy update webcast. Engage with portfolio manager, David Iben, to learn about what drove fourth-quarter performance, the portfolio manager's outlook, and current portfolio positioning. Join us for our quarter-end strategy update webcast. Engage with portfolio managers to learn about what drove fourth-quarter performance, the portfolio manager's outlook, and current portfolio positioning. Join us for our quarter-end strategy update webcast. Engage with portfolio manager Andrew Kurita to learn about what drove fourth-quarter performance, the portfolio manager's outlook, and current portfolio positioning. Join us for our quarter-end strategy update webcast. Engage with portfolio manager, Christian Diebitsch, to learn about what drove fourth-quarter performance, the portfolio manager's outlook, and current portfolio positioning. Join us for our quarter-end strategy update webcast. Engage with portfolio manager, Arnaud Gandon, to learn about what drove fourth-quarter performance, the portfolio manager's outlook, and current portfolio positioning. Join us for our quarter-end strategy update webcast. Engage with fund manager Alexander Gunz to learn about what drove fourth-quarter performance, the team's outlook, and current portfolio positioning. The Heptagon Future Trends Fund provides investors with access to a high-conviction, concentrated portfolio of global equities that are exposed to a diverse set of themes, all of which look set to grow in importance. The team at Heptagon Capital has been writing proprietary thematic commentaries on topics as varied as robotics and molecular diagnostics for the last seven years. Heptagon subsequently launched a UCITS fund centred on its best-of-breed ideas derived from this research at the start of 2016. The Fund focuses on a wide number of themes (currently 12), but invests exclusively in businesses that offer pure-play exposure to the trends in question (defined as at least 75% revenue being theme-derived). All of the businesses in which the Fund invests are market leaders in their respective fields, spending above-average levels of research and development in order to sustain their dominant position. Leading plays on cybersecurity, alternative energy, and robotic-assisted surgery have been the biggest contributors to returns over the past year, highlighting the diversity of the Fund. Join us for our quarter-end strategy update webcast. Engage with portfolio managers to learn about what drove third-quarter performance, the portfolio manager's outlook, and current portfolio positioning. 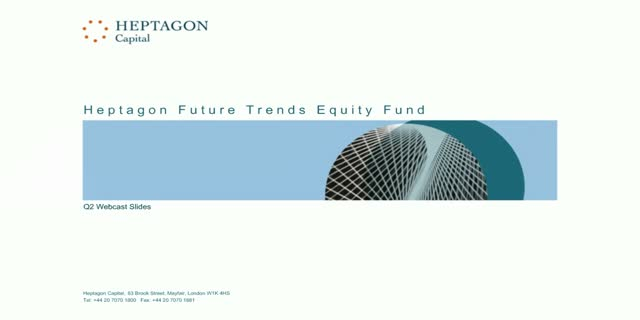 Heptagon Capital UCITS Fund quarterly Fund Manager calls, covering US, European and Global Equities.